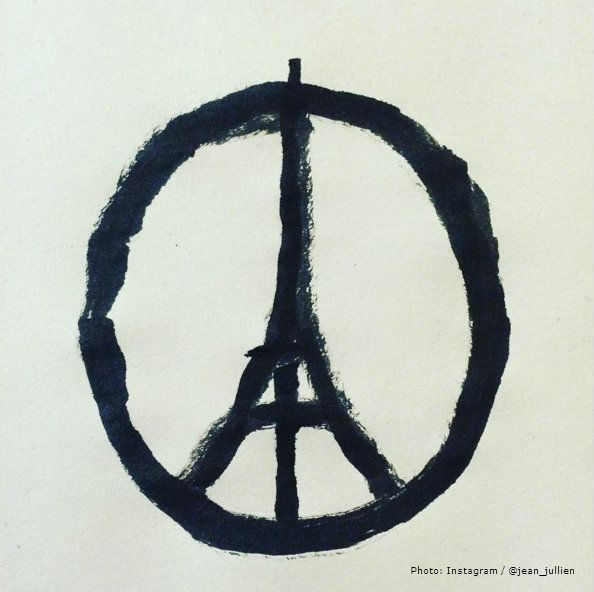 This symbol went viral as people across the world showed their solidarity for the Paris attacks. What is the Stoic approach? Blood on the streets of what had just been peaceful neighbourhoods. The mutilated bodies of men, women and children, innocent victims of sudden violence, strewn among the wreckage. The survivors, wounded and terrified, trying to understand what has just happened to them. Only slowly will they realize that their lives have been shattered forever. But the state then responds quickly with all the armed force it can muster. The perpetrators are either killed on the spot or hunted down and taken prisoner. Those captured are then sent to the capitol, where they paraded before a jeering crowd before being publicly executed. As readers will surely realize after the last sentence, this is not a description of the recent terror attacks in Paris. The event referred to is instead the invasion of the Roman province of Pannonia (the upper Danube region) by the Marcomanni and the Quadi (ancient Germanic tribes) sometime between 167 and 170 CE. The “Marcomannic Wars” (ca. 167-180) in no way prefigured the current conflict with the terror group Daesh (better known as ISIS). Nevertheless, those of us interested in Stoic philosophy may find it worthwhile to consider how second-century Romans, living during the final flourishing of Stoicism in the ancient world, responded to a violent attack on their own way of life. The Historia Augusta claims that the Marcomannic Wars had “surpassed any in the memory of man.” The Romans themselves, accustomed as they were to war, brigandage and violent crime, were shocked by the brutality of the attack. Even though the fighting never came close to the city of Rome itself, panic still broke out there, for this was the first time that Italy had been invaded in over 260 years. The man who had the task of repelling the invaders was the emperor Marcus Aurelius (reigned 160-180 CE). Today Marcus is far better known as a philosopher than a warrior. While the Marcomannic wars have long been forgotten, Marcus’ philosophical journal, the Meditations, still enjoys great popularity. But Marcus spent much more of time fighting than philosophizing. His valiant yet frustrating attempts to pacify the region only ended with his death. In the year 176 CE, however. Marcus decided he had achieved enough success to hold a triumph in Rome, which he celebrated together with his son and successor Commodus (reigned 180-192 CE). Victorious but traumatized, the Romans would never forget the Marcomannic onslaught. Proof of this can still be seen in Rome today at the Palazzo Colonna. Dominating this square is.the “Aurelian” column, dedicated to Marcus Aurelius and his triumph over the Marcomanni and the Quadi. The column, originally erected at the Campus Martius, the “Field of Mars” (dedicated to the Roman god of war), is some 30 metres tall. Running down the entire length of the column is an elaborate relief, comprised of many scenes from the wars Marcus fought: terrified women and children fleeing the attackers, the savage combat between the legions and their foes, as well as the gruesome retribution taken by the victorious Romans. To the side, impassively viewing the suffering, fighting and dying, is Marcus Aurelius himself. The Romans had repelled the “barbarians” — at least for the time being — and restored their sense of security. And how will we in the West today, the cultural heirs of Rome, confront our own security threats? Comparing the Marcomannic Wars to 21st century Islamist terror may sound far-fetched. The Germanic invasions posed an existential threat to the Roman Empire. The attacks carried out by Daesh, however horrific, do not, as yet, have the power to bring about the decline and fall of Western civilization. And yet, this is exactly the comparison being made right now. Just as Rome fell because it allowed too many Germanic people to live within its borders, it is argued, so contemporary Western society is now threatened by its many Muslim inhabitants. Such rhetoric is not only coming from private citizens opinionating in their personal blogs, but also from serious thinkers writing in respected media sources. The well-known but controversial historian Niall Ferguson, for instance, compares the West to a tottering empire. As he views it, the distant shock to this weakened edifice has been the Syrian civil war, though it has been a catalyst as much as a direct cause for the great Völkerwanderung of 2015. As before, they have come from all over the imperial periphery — from North Africa, from the Levant, from South Asia — but this time they have come in their millions. Without using the actual word, Ferguson portrays the refugees as the new barbarians: an alien people who practice a religious faith hostile to Western values. His conclusion is clear. We should fear these people, prevent more of them from coming to our homelands, and roll back the influence of those who are already here. Otherwise we shall suffer the fate of the Romans. Stoicism Today is a forum for philosophical matters; therefore the cogency of such arguments, as well as the proper political responses to terrorism and migration, must be discussed elsewhere. But there is a Stoic aspect to these matters. Like the ancient Romans in the aftermath of the Germanic invasions, many of us today in the West now live in an atmosphere of fear and anger. The desire to eliminate threats to our physical safety and to punish those who assault us is natural. As the ancient Stoics admonish us, however, we must not allow primordial passions to guide our thinking, but reason and practical wisdom. Stoics recognize the need to take a step back from our emotions, examine the representations of reality they create, and analyze their accuracy before formulating a reasoned response. Regarding the subject at hand, what is it exactly that demands a response from us? If we are not members of the military or the police, then most of us are only personally affected by the crisis when we personally encounter the refugees fleeing their homes in Syria to seek safety and shelter among us. And Stoic philosophy can be of great benefit here. The greatest Stoic teacher we know of, Epictetus (lived c. 55-135 CE), claimed that Stoic principles make love in a house, concord in a state, peace among nations and gratitude to God (Discourses, Chapter V). That is to say, Stoicism holds out the promise of the community of all humankind. The goal of Daesh, however, is to destroy that community by sowing discord between Muslims and non-Muslims. As a BBC-journalist recently wrote, To maintain the flow of recruits in the long term, the jihadists need to make Muslims feel more vulnerable and alienated in Western societies. The greatest individual contribution a Stoic could make toward establishing world peace would be to cast aside his or her own fears and welcome all those now fleeing from violence and terror in the Middle East. The presence of the refugees already here, as well as the fact that many more are on the way, are matters that lie beyond our personal control. What is up to us, however (no matter how we believe the refugee crisis should ultimately be addressed), is to show them the kindness all Stoics are expected to show every inhabitant of this planet. As Marcus Aurelius said, Adapt yourself to the environment in which your lot has been cast, and show true love to the fellow-mortals with whom destiny has surrounded you. True, some terrorists may have hid themselves among the refugees. Reason nevertheless dictates that the majority of them have fled their homes because their lives were threatened. The few cases who might pose a danger to us are a matter for the authorities. Meanwhile, In order to live with the uncertainty, we need to have the courage of our convictions. The problem is that we too often tend to cast aside our Stoic principles when remaining true to them requires an effort on our part. As Epictetus also said, We indeed are able to write and to read these things, and to praise them when they are read, but we do not even come near to being convinced of them. (Discourses, Chapter V). The author of the essay you are now reading is as guilty of this failing as anyone else. I live in Germany and Sweden, the two European nations accepting the greatest number of refugees. (Sweden, with only 9 million inhabitants, has taken in more Syrian refugees per capita than any other country.). When I encounter refugees with what I would consider stereotypical features of conservative Muslims (men with beards, women with headscarves), I have to confess that my first reaction is a sense of unease. Who are these people? Why are they here? What do they believe? But then I try to step back and consider the soundness of my immediate reactions. Am I the type of person to judge others by their outward appearance? After all, my own grandmother never went out of the house without a headscarf, and she was a devout Protestant. Moreover, when I’m out on the streets of Gothenburg and Berlin, I see bearded hipsters by the score. But I have no fear of grandmothers or hipsters. What have these refugees done to deserve my apprehension? Are they not here precisely because they didn’t want to live in a land dominated by extremism? They have taken on incredible hardships to get here. (Many of them don’t get here at all.) While it is safe to assume that the refugees I see on the streets don’t share all of my values (which is the same case as with almost all of the native Europeans I meet), I have no rational reason to believe that they pose a threat to me, my family and friends, or European society in general. The immediate representation of “Muslims” in my head does not correspond to the reality of the individual before my eyes. These people are not barbarians. They are human beings. Kevin Kennedy is a 53-year-old German-American historian, writer, lecturer and commentator. He live with his Swedish partner and their two children in Potsdam, Germany and Kungsbacka, Sweden. His academic specialty is eighteenth-century Prussian history. He discovered Stoicism some twenty years ago, but it has only become a part of his daily life since the first Stoic Week in 2013. He can be reached at kevin.alterfritz@gmail.com. The year is 2018 so 3 years after this article has be written. I do not know if it is Stoic or not to heed the “Conspiracy channels” but it seems that more and more resources suggest the the migrants themselves are just a tool to bring chaos to Europe so that the countries that form this union can be better manipulated. I do not know if this is true. I do know that Cato is also a Stoic example worthy of admiration. My question is (trying to see the big picture, myself an aspiring prokopton) is the “migrant crisis” just another shady political tool and should we follow Cato’s example and push back ? Just as he did with Cesar ? Keeping in mind that from when this article has been written 3 years ago, the whole situation for Europe has changed to worse – Sweden taking much of the negative impact of this phenomenon. I found this article by searching this sensible topic. I am grateful for any answers. Thanks. So, on the one hand we have the civilized world and on the other the barbarians. And of course together they make up the mankind. This is enough to make me feel uneasy. I commend Kevin Kennedy for providing a reasoned, “Stoic” perspective on the horrendous terrorism the world has witnessed recently, in Paris and elsewhere. One common misunderstanding of Stoicism is that it counsels us simply to accept “fate” or “reality” as it is, passively acknowledging that there will always be violent and sadistic people in the world. Of course, Marcus would never have endorsed that view, or he would not have been engaged in battle with the “barbarians”! Yet Stoicism, in my view, does pull us back from blind hatred and vindictive violence, even toward those who seek to destroy Western civilization (as Daesh surely intends). Stoicism reminds us that “…all things are woven together and the common bond is sacred…” (Marcus Aurelius). And Seneca’s meditation on “hatred” is even more to the point: “Hatred is not only a vice, but a vice which goes point-blank against Nature…Hatred makes us destroy one another. Love unites–hatred separates.” So yes–we must resolutely oppose the terrorists and defeat their evil schemes, while also remembering the “common bond” that unites all of us as human beings. The media are so-called for a reason, they mediate our view of the world. Acknowledgement of this truth as well as a sound picture of the world based in Stoic Physics i.e. as close to reality as possible, with which to judge [Stoic Logic] the information we receive from the media makes, I think, a good grounding for action in harmony with Stoic Ethics. Taking a moment to step back mentally from the up-welling of instinctive emotional reaction, maybe retreating for the nonce to Marcus Aurelius’ Citadel, could help the process. It is interesting to learn that Marcus himself, in a parallel situation, chose to exact a “gruesome retribution”. Constrained, I suppose, by his role as Emperor of Rome.